An astonishing two-goal burst in the first six minutes by loanee striker Shea Gordon made the difference as Partick Thistle opened up their Group E Betfred Cup campaign with a 2-0 win at Stenhousemuir on Saturday, writes Craig Goldthorp. The Championship aide started strongly and went a goal up after just two minutes when Blair Spittal's fine run and cross from the right set up Gordon to tap home from close range. 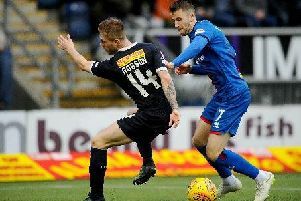 Just four more minutes had elapsed when Motherwell loanee Gordon (20) netted again, the Northern Irishman volleying spectacularly over Stenny keeper Grame Smith - a former Motherwell player - after Sean McGinty's long ball forward. Thistle almost went three up within two minutes when Gordon's cross from the right was met by Kris Doolan whose effort was saved. League Two Stenny had started slowly but created an opening after 15 minutes when Conner Duthie passed to Mark McGuigan whose low shot was saved by Aaron Lennox. The hosts' Alan Cook produced a dangerous cross from the left after 12 minutes which just evaded McGuigan in the middle. And it was Cook who produced Stenny's best effort of the half so far on 20 minutes when Duthie's short free-kick set him up to unleash a left footed shot from outside the box which Lennox tipped over. Thistle continued to look the classier side and came close to going 3-0 up on 34 minutes when Doolan pounced on a misplaced pass and went round the keeper, but eventually ran the ball out of play for a goal kick. Thistle keeper Lennox didn't reappear for the second half after apparently injuring his right leg when taking a goal kick. He was replaced by Jamie Sneddon. The Jags came close to increasing their lead on 52 minutes when Spittall's powerful header was well stopped by Smith. And the Maryhill men soon wasted another fantastic opportunity when Doolan chipped over the bar from a great position after fine work by Chris Erskine. Blair Spittall's 54th minute header for Thistle was saved by Smith, before Stenny were lucky not to concede a goal in bizarre circumstances when a cross by Thistle sub Miles Storey was headed against his own bar by Morgyn Neill. The Warriors kept battling manfully and came close to pulling a goal back when McGuigan set up substitute Colin McMenamin whose long ranger was turned round the post by Sneddon. The final action of the match saw Doolan have a close range effort deflected wide from a McCarthie delivery. Stenhousemuir: Smith, Reid (McMenamin 66), Donaldson (Johnson 86), Neill, Tena, Gibbons, McGuigan, Duthie, Cook, Ross, Halleran (Dickson 62). Partick: Lennox (Sneddon 45), Elliott (Storey 57), Penrice, O'Ware, McGinty, Spittall, Doolan, Erskine, Storer (McCarthie 66), Gordon, Slater.